My friend Jim and his son Scott are still talking about hunting the biggest, meanest, baddest, ugliest, smelliest creatures on this earth. 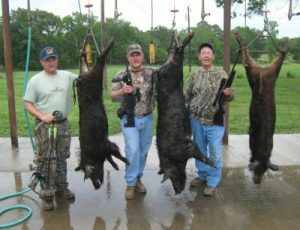 Their first wld boar hunt began last May after one of the hunters booked it online. Scott and three hunter friends from Cedar Rapids, Iowa, met Jim at Langley Ranch, a commercial hunting operation outside Centerville, halfway between Houston and Dallas. Wild boars are elusive, intelligent creatures. Jim says they can smell food up to seven miles away or buried 10 feet in the ground. Some of the hogs at Langley Ranch have strong genetic ties to the Russian boar. Known for their scruffy, black coats and threatening tusks, their quick tempers send many a hunter scrambling up a tree for safety. Jim said, "They are very mean. They'll chase you. If you shoot one and don't get it dead, you better watch out because he's going to come get you." The hunters' guide, driving a four-wheel drive vehicle, showed them the hogs' trottin' grounds of pasture thickets, running creeks, mud bogs and food plots, where they are fed corn. The hunters followed the hogs' paths on foot or climbed into deer-like hunting stands to wait for their prey. "You always try to stay upwind of them," Jim said. "That's why being up in the air is important." The guide located the hogs and "brought them around for us," Jim continued. "He keeps them movin'." Jim shot the first one with his new, 150-pound crossbow and arrow. He likes the sport of it. The weapon's arrow has four blades like razors on its tip. The arrow pierced the hog, but he ran off. Later Jim found part of his arrow, bloody and half-broken, minus the hog. 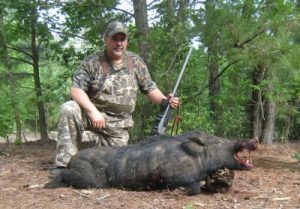 Later in the day Jim shot the group's first hog with his rifle. 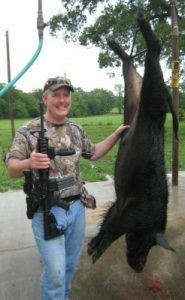 The animal weighed 214 pounds, the heaviest hog taken during the four-day hunt. "Everybody said I about broke my arm patting myself on the back." The ranch owner loaded the hogs in a four-wheel drive vehicle. Back at the camphouse where the hunters stayed, the hog was skinned, bled out, hung up, weighed, cut into sections and stored in a walk-in cooler. In all, the hunters bagged eight hogs with a total weight of 1,414 pounds. At night the men sat around a campfire, told stories and jokes, ate and drank beer. "Would I go again?" Jim asks rhetorically. "In a heartbeat."